API POND-ZYME SLUDGE DESTROYER Pond Water Cleaner with Barley reduces build-up of fish waste and consumes pond sludge, which is typically a build-up of organic matter that degrades water quality and clogs pumps and filters. 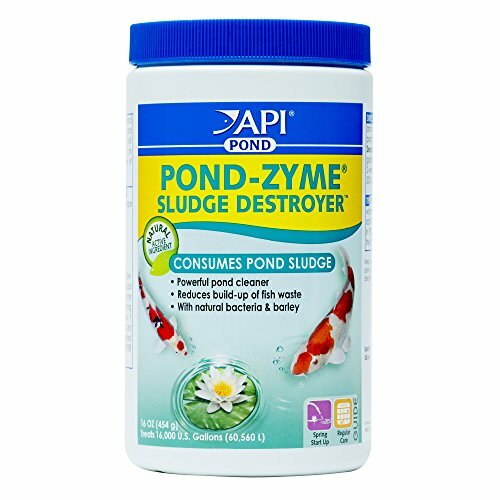 POND-ZYME SLUDGE DESTROYER uses natural bacteria and barley as active ingredients to break down algae and fish waste, digest leaves and grass clippings, and reduce overall pond maintenance for the season. This product is exclusively for use in ornamental ponds. Use as directed, dosing twice a week for two weeks at the beginning of the spring start-up season and at the end of the season, and dosing once every two weeks for regular maintenance. With API POND products, it’s easy to keep a beautiful pond. For over 50 years, API has been creating innovative, research-driven solutions that make it easier to care for your pond. API POND Pond Treatment Supplies are designed to work in conjunction with each other to provide best results to control algae, promote healthy bacterial growth and help control and cure fish diseases and conditions such as ich and fin rot. They work to provide a safe, hospitable environment for fish such as koi, catfish, perch, goldfish and more. With API, you can spend more time admiring your fish, and less time scrubbing your pond. Make sure to use all products as directed in order to ensure the best results.